The choice of many voters in this year’s U.S. presidential election could hinge on a relatively simple calculation. Do they embrace the prospect of change as represented by Republican Donald Trump or opt for the stability and temperament offered by Democrat Hillary Clinton? At the moment, public opinion polls suggest a growing number of Americans may be choosing for the latter. This stark choice between change and temperament has been highlighted on the campaign trail where Clinton has ramped up her attacks on Trump’s character and fitness to be president. 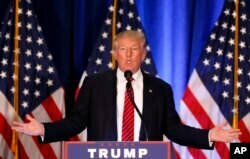 “There is no doubt that Donald Trump is temperamentally unfit and totally unqualified to be president of the United States and commander in chief,” Clinton said to cheering supporters during a recent rally in Scranton, Pennsylvania, one of several key swing states where Trump appears to be losing ground in the latest polls. 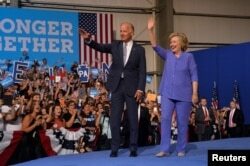 Democratic presidential candidate Hillary Clinton and Vice President Joe Biden campaign together during an event in Scranton, Pa., Aug. 15, 2016. Clinton was joined at the rally by Vice President Joe Biden, a Scranton native, who said Trump was “totally, thoroughly unqualified” for the White House. Clinton has surged in recent polls in part because of growing voter concern about Trump's temperament. A recent Bloomberg Politics poll found 56 percent of those surveyed believe that Clinton does have the right temperament, while only 31 percent said the same of Trump. There were similar results in a Monmouth University Poll in which 27 percent of those surveyed said Trump had the right temperament, while 67 percent said no. In the same poll, 61 percent said they believed Clinton did have the right temperament while 34 percent said she did not. But those same polls also show many voters continue to distrust Clinton. Monmouth found that only 27 percent of those asked believe Clinton has been honest about her use of a private email server while secretary of state, while 64 percent do not. The Trump campaign is well aware of the Clinton effort to render him unfit, and Trump tried to turn the tables during a recent foreign policy speech in Ohio. Republican Presidential candidate Donald Trump speaks in Youngstown, Ohio, Aug. 15, 2016. ​"Incident after incident proves again and again that Hillary Clinton lacks the judgment, as said by Bernie Sanders, stability and temperament and the moral character to lead our nation," Trump said. Like Clinton, Trump is also relying on surrogates to help make his case, including former New York City Mayor Rudy Giuliani. “In almost every area that we can think of, things are worse today than they were on the day Hillary Clinton walked into the State Department,” Giuliani said at Trump’s Ohio rally. Trump could also benefit from the public’s desire for change. On average, about two-thirds of Americans polled say the country is on the wrong track. At the same time, President Barack Obama’s approval ratings have risen into the low to mid-50s, fairly strong for a two-term incumbent and a factor that could help Clinton. But when it comes to some basic poll numbers, both candidates suffer from a negative image that could limit their appeal, according to Gallup pollster Frank Newport. "Donald Trump has about 63 percent of the American public who, when we asked them, said their opinion of him is negative. Hillary Clinton right now has about 55 or 56 percent of Americans who say their opinion of her is negative. So her unfavorable [rating] is not quite as high," Newport said. Many Republicans argue that Trump is long overdue for a shift away from controversial rhetoric toward a more disciplined effort aimed at widening his appeal, a kind of political makeover. 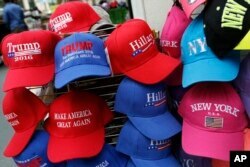 Hats displaying support for Democrat Hillary Clinton and her opponent Republican presidential candidate Donald Trump are displayed by a sidewalk vendor in New York, Aug. 16, 2016. Another critique is that Trump needs to focus more on Clinton and less on picking distracting fights with the media and others. “He has a really hard time of just sort of backing down from some sort of fight or argument, and it has caused him to keep a lot of controversies alive that a different kind of campaign could easily deal with,” University of Virginia analyst Kyle Kondik said. Trump shook up his campaign leadership team again this week in hopes of a political rebound, tapping Stephen Bannon of the conservative news website Breitbart to be his campaign’s chief executive officer and longtime Republican pollster and strategist Kellyanne Conway to be his campaign manager. Campaign chairman Paul Manafort will stay with the campaign and retain his title, but it is unclear what his future role will be. Trump made it clear that a radical transformation of his blunt style is not going to happen anytime soon. He told a Milwaukee television station he will remain loyal to the voters who embraced his "tell-it-like-it-is" approach in the Republican primaries. Brien Wedlock, right, and Matt Catanzaro are pretty much ignored as they wear Donald trump capes at a campaign rally for Democratic presidential candidate Hillary Clinton, in Scranton, Pa., Aug. 15, 2016. “I do not want to change. Everyone talks about, 'Oh, when are you going to pivot?' I do not want to pivot. I mean, you have to be you,” Trump said. Clinton has built a steady lead in recent national and key state polls including Virginia, Florida, Colorado and New Hampshire. She leads Trump nationally by a margin of 7 to 8 percent based on an average of several recent surveys. But Clinton appears to be taking nothing for granted. Trump’s next best chance to reset the campaign may not come until the first presidential debate in late September, more than a month away. By that time, early voting will have begun in some states, adding to the Trump campaign’s difficulties in trying to turn around his political fortunes. In a twist of irony, Trump may have to look for inspiration to the father of one of his former rivals, former President George H.W. Bush, who was able to overcome a 17-point lead by Democrat Michael Dukakis and win the 1988 presidential election. This year, of course, Trump vanquished the former president's son, Jeb Bush, in the Republican primaries.